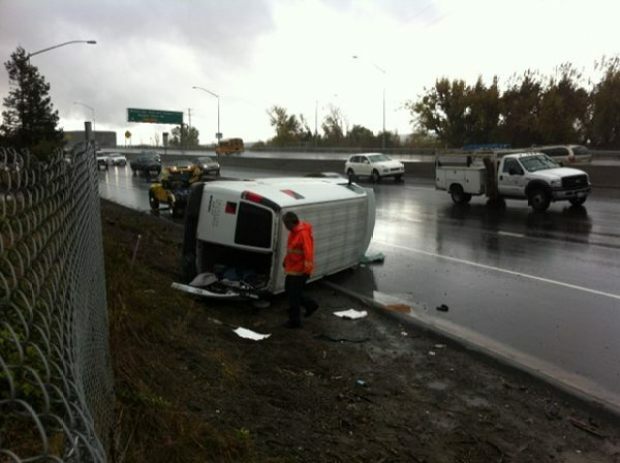 The first in a series of storms that hit the Bay Area Wednesday arrived a bit late, but came with the predicted power. By late morning, heavy rains and gusty winds caused dozens of car crashes, downed trees and flight cancellations. The wind gusts clocked at Poverty Flats in Santa Clara at a whopping 77 mph, 66 mph at Mt. Diablo, 53 mph in Los Gatos, and 45 mph in San Francisco. "Traffic was terrible," said Bobby Edwards, who was commuting from Benicia over the Bay Bridge. His commute took an hour on Wednesday, a drive that would normally take him 25 minutes. San Francisco International Airport saw a total of 90 flights canceled because of rain, low visibility and winds. Anais Suchiam, who was stuck at SFO and hails from London - where it rains a lot - said she simply "couldn't understand" what all the fuss and cancellations were about. 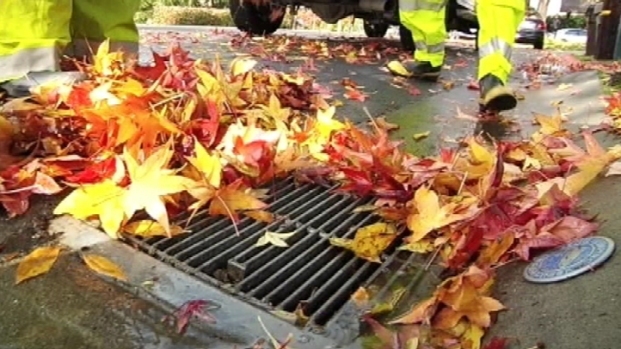 Jodi Hernandez shows us how city crews are already cleaning up from today's rain in preparation for the next round of storms headed toward the Bay Area. The Bay Area storm, dubbed round No. 1, made its way out of the region by lunch. The next system is expected to arrive Thursday night and last into Friday. It is a traditional north to south weather system with rain starting north of the Golden Gate and moving south. The next system has more moisture content with as much as two to four inches of rain falling. Many are concerned about potential flooding in the North Bay and in the Santa Cruz mountains now that the ground is already wet and there is more rain the forecast. The San Anselmo creeks and rivers are among those at risk, so the city is handing out free sandbags so residents can prepare for the wet weather. The first storm of the season brought lots of rain to Bay Area roadways and as Kris Sanchez reports, that made driving dangerous. And that won't be the last storm of the week. Storm No. 3 is expected to arrive Saturday. It will bring hit and miss showers at best. A last storm of the series is the biggest of them all. It is expected to arrive Sunday. NBC Bay Area meteorologist Anthony Slaughter describes it as the mother ship arriving at port. Slaughter says the "mother ship" is a system that is sitting off the coast and has been spitting out the rest of the storms. That mega-system will move itself on in come Sunday. It has the most moisture of all of the systems and could bring yet another three to five inches. Our first break in the weather won't come until next Monday. The storms will also bring high surf along the coast. When it comes to snow in the Sierra, the news is nearly all bad. Meteorologists at the National Weather Service in Reno say it will be mostly rain below 8,000 feet. Above 8,000 the NWS is only forecasting two feet of snow. Reduce your speed in rainy, foggy and windy conditions. Motorists should be aware that Black Ice may develop, usually near bridges, underpasses and low or shaded areas. Slow down and move over when Caltrans workers, law enforcement or tow truck drivers are working near the roadway. Be aware of electronic message boards and other road signs with information on incidents, changing road conditions, lane closures or detours. Make sure that vehicle brakes, windshield wiper blades and tires are in good condition and inspect your head and tail lights for maximum visibility on the highway. Call 911 to report any hazardous conditions.